If, by some miracle you were able to watch each of the films, you would not only have wasted 24 days (longer if you insist on bathroom breaks and snack preparation) of your finite life, you would also be none the wiser about the facts pertaining to the end of the world. What you would discover, however, is that our pop culture and modern society generally are obsessed with the apocalypse and beyond. The obvious fact that these predictions have proved to be empty has done nothing to stem the tide of end-time date-setting. And it cert­ainly hasn’t diminished the foreboding of many that life on our planet is doomed. In fact, in a recent worldwide Reuters poll, one-in-seven people believed the world would end during their lifetime. Professed Bible students have frequently stoked paranoia about the end of the world. One of the more dramatic recent examples (of many) was radio preacher Harold Camping’s multiple failed predictions that Jesus was coming back. Not only did Camping preach his date-setting gospel on the California-based radio station he ran, he also put up billboards announcing the date to passing motorists. The Camping prediction that got the most attention was the claim that Jesus would return on May 21, 2011. Camping was a master promoter. He was able to build a global following and raise millions of dollars telling people that Christ’s return would trigger the rapture of some to heaven. For those left behind, he said there would be months of fire, brimstone, plagues and death until the whole world would be destroyed on October 21, 2011. When this failed to materialise, Camping was declared a fraud by the media and support for his radio ministry cratered. 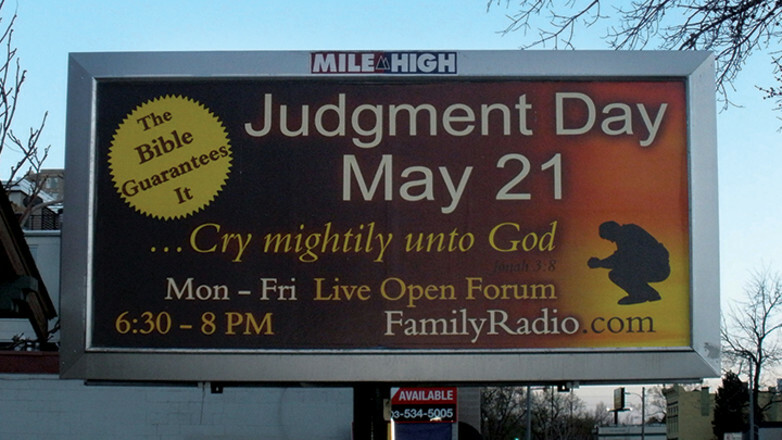 A Family Radio sign in Denver predicting the end of the world on May 21, 2011. Further back, in the nineteenth century, thousands of people around the world believed that Jesus Christ would return to Earth on October 22, 1844, based on the Bible interpretations of a preacher by the name of William Miller. There’s every indication that he was genuine in his belief and had studied the Bible carefully to reach his conclusions. Many in this movement believed his message, completely checking out of society, to the point of selling their property and clearing their debts, to await the second coming of Jesus. The bitter reality when Jesus didn’t come back became known as The Great Disappointment. With these kinds of dramas, it is hardly surprising that people are sceptical about fear-mongering tactics and ultra-specific predictions used by some to proclaim the end of days. You’d be forgiven for asking whether there is anything more to Christian belief that Jesus is coming back than wild speculation or fundraising for a charismatic speaker who claims to finally have the right date. However, if true, Jesus’ promise that He is coming back to Earth is big enough to merit sincere study. If there is some ancient truth to be known about the return of Christ, wouldn’t you want to know about it? Instead of chasing the latest sensationalist prophet of doom, the right place to begin a study of the second coming is in the Bible. Contrary to popular misconception, the Bible is not vague or confusing about Jesus’ return. It’s fairly straightforward, in fact. Matthew 24:36 speaks of the event and stresses that “about that day or hour no one knows, not even the angels in heaven, nor the Son, but only the Father.” So you don’t have to waste your time plugging numbers into second coming date-guessing algorithms—we simply are not privy to that information. Neverthless, the Bible is clear that it is important to live knowing that Jesus is coming soon. Every moment that passes here on Earth brings us another step closer to the great day when Jesus comes back. The Bible definitely describes the second coming as a literal event. There won’t be any ambiguity about what is happening when it occurs. Jesus will appear in the sky in much the same manner as He ascended after His resurrection (see Acts 1:11), but with a display in the heavens that will outshine the sun! Some misread 2 Peter 3:10, which compares the second coming to a thief in the night, thinking this means there will be people who will completely miss the event. It’s important to read the descriptions in the rest of the verse: “The heavens will disappear with a roar; the elements will be destroyed by fire, and the earth and everything done in it will be laid bare.” So rather than being a secret event, Revelation says that “every eye will see him” (1:7). The apostle Paul says Jesus will be “revealed from heaven in blazing fire with his powerful angels” (2 Thess­alonians 1:7). That isn’t exactly ambiguous or metaphoric! As much as zombies and alien attacks might make for adrenaline-fuelled and frequently terrifying movie plots, for God’s faithful people who are looking forward to the event, the second coming isn’t something to fear. Rather, the Bible describes a joyful event that we all are invited to anticipate. One unbeatable reason the Bible gives to look forward to the second coming is that when Jesus finally comes, our degraded human nature will be completely changed for the better. Those who died believing in Jesus will rise immortal (1 Corinthians 15:51–54; 1 Thess­alonians 4:15), which is another common movie theme. The second coming promises relief from what we have been forced to accept as reality here on earth. God will live with us, wiping away all sorrow and tears. Gone is death and mourning, and pain and loss (Revelation 21:4). Death is described as the last enemy defeated. But there’s another group—one that has rejected Jesus and is horrified at the thought of the second coming. When Christ appears, this group will plead for an end to their lives (see Revelation 6:15–17). It’s clear that the Bible is warning us against defaulting to allegiance with this group. We can instead accept God’s invitation to join His people who welcome Jesus, saying, “Surely this is our God; we trusted in him, and he saved us. This is the Lord, we trusted in him; let us rejoice and be glad in his salvation” (Isaiah 25:9). No, it won’t be like the movies. It will be infinitely better.